Are your sales lead generation investments being wasted? Billions of business-to-business marketing dollars are spent each year on sales lead generation. Billions more dollars are spent to fulfill and follow up on marketing responses, and to determine which sales leads are qualified and ready for sales attention. Unfortunately, much of this investment in lead generation is wasted. Why? Because lead generation programs and lead qualification efforts are not in harmony with the needs of sales. 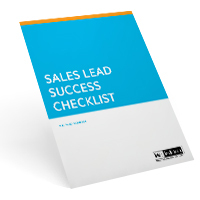 Have you calculated how many qualified sales leads are needed in the sales pipeline in order to meet or exceed the company’s sales revenue goals? Have you broken that number down into how many qualified sales leads are needed each month and each quarter? Have you built your company’s sales lead generation programs with those target numbers in mind? Have you put in place programs specifically designed to weed out the non-prospects and nurture the longer-term, not-yet-qualified opportunities-only forwarding the truly qualified sales leads to salespeople, reps, resellers or distributors for follow-up? Have you budgeted appropriately for this important sales lead development function? If you answered “yes” to these questions, the good news is that you are not guilty of wasting your company’s lead generation investments. Instead, you are probably well-respected by the people in sales and corporate management. If you do need help with your lead generation programs, please contact me to find out how I can make your lead generation a success.